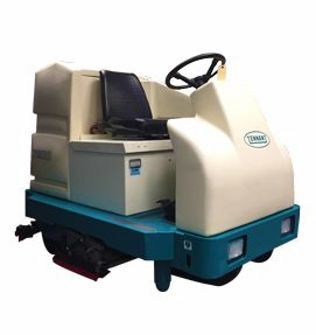 The Tennant 7200 is a battery-powered, ride-on, industrial floor scrubber that’s compact, durable, and reliable. This Tennant scrubber is ready to deliver the best cleaning results down aisles, around corners, and even in tight spots. With up to 3 hours of quiet run-time, the 7200 cleans effectively in even the most noise-sensitive settings. Note: There is an updated version of the Tennant 7200, now called the Tennant T16. Learn more about the Tennant T16 scrubber. Step up your cleaning productivity with FaST™ foam cleaning technology, an innovative foam based detergent in the 7200 that achieves clean, dry, and safe floors all in one pass. Not only does this scrubber technology allow operators to clean up to 3 times as long between emptying and filling, but it also eliminates the need for operators to handle chemicals. You can rest easy knowing your Tennant 7200 floor cleaning machine makes maintenance as simple as possible. From an easy-to-access battery compartment to no-tool brush and squeegee adjustments, you’re selecting a machine that has minimal downtime and optimal cleaning productivity. This compact ride-on floor scrubber allows for daily cleaning across a large variety of environments. With the choice of cylindrical brushes (to sweep and scrub) or disk brushes (to scrub), you can customize your Tennant 7200 to meet your business’s cleaning needs.